Just what you look forward to every month…cleaning your stinky, but sweet dog’s bed. You have a choice whether to make it fun and easy OR cumbersome and with little thrill. Choosing fun and easy sure seems like the way to go. So, turn up the music, open up the windows, enjoy the nice spring day and follow these easy tips to make cleaning your dog’s bed simple, easy, and fast! Vacuum the cover: You’ll first want to get as much of the dog’s hair off of the bed before washing. We know how pet hair likes to stick to wet fabric in the washing machine, so be sure to remove as much as you can beforehand to get a cleaner bed. It’s easiest to use your vacuum hose and an upholstery attachment. Keep your focus on the sleeping surface; however, make sure to remove dust and fur from the entire cover. Remove the cover: Most dog beds have removable covers, so that washing is made simple. Be sure to remove the cover completely. If the cover is not removable, check the washing instructions and follow the directions. You may need to take it to a laundromat to use the larger, high-capacity washers. Use stain/odor remover: If you have dogs like ours, a good stain/odor remover is essential to cleaning the dog bed most efficiently. Simply washing it may not effectively remove all the stains from the dog bed cover. Most people search high and low to find a product that will actually do what it says and take the odor out from our wonderfully smelling dog’s bed. Check out the #1 Release on Amazon, Apply Guard PET, that will leave you utterly speechless on how clean your dog’s bed becomes with the use of this product. Dogs are sensitive to chemicals, which is why this product is highly recommended…there are NO harmful chemicals used in Apply Guard PET. Wash the bed: Load the cover or entire bed into a front-load washing machine and wash it in hot water to destroy any pet dander or unwanted creatures that may be on the bed. If the dog bed is too large to be washed in the washing machine, you can simply hand wash it in a bathtub using hot water and mild detergent. Remember the music is playing, the sun and breeze are coming in…this is a fun project! Make sure to thoroughly rinse all detergent from the bed before drying. Dry the bed: If you live in the South or a warm climate, simply hang the bed outside to air dry, especially if the cover is too large to dry in your home dryer. Using a dryer sheet will reduce static and will also help to separate any remaining pet fur from the bed. Be sure to hang the pet supplies in a well ventilated area to dry to prevent mildew and mold from growing. 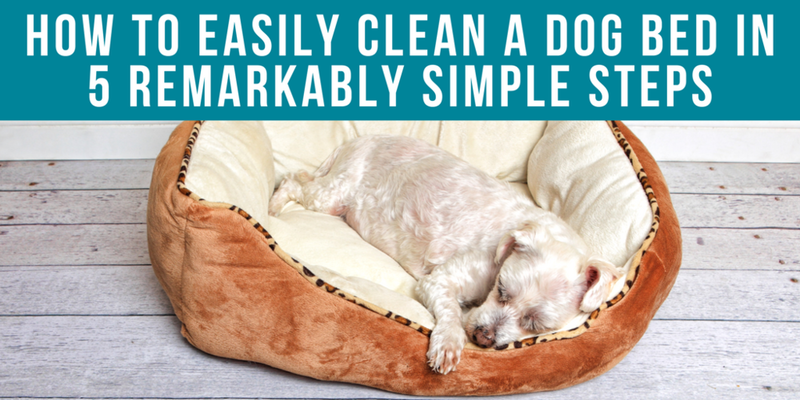 These simple dog bed cleaning steps will help you get back to enjoying your beautiful day and your precious dog will thank you! Did you Enjoy this Blog? Share it with your friends!